on warrants for arrest, on marriage certificates. On this page is my father, who has been wanted by time. all his brothers' names are made of water. after drinking at midnight, leaving her washing the scars on her body with her baby in arms. his twin brothers' early death and crippling. my father's sister who eloped when young but became a tonsured nun when old. screwing: gambling and screwing around half his lifetime, my father became a drug addict and seller. to become my brothers, to become me. the pages of the ocean that become all the whiter with every leafing. Stairs are the dreams of the poor. to see the scenery all over the world. and carried out when typhoons came. We climbed up to the roof with Father to mend the iron sheet, to mend the doors and windows. one drop of rain after another. the fountainheads of dream that allowed no invaders to occupy. The shoes were worn out, on a muddy rainy night in the city. A wanderer felt his socks at the crossroads. The shoes were worn out, the feet got wet. you washed clean my black sports shoes. the feet were in the wrong shoes. that red pair of leather shoes I wore on our wedding day. that pass by our doorway in the evening. The shoes were worn out, on the way home. The garden, a warehouse of memories. My illiterate grandfather is sitting in the narrow house waiting for the flowers to bloom. the ants that are carrying away his drowsiness. the out-dated calendar on the wall. He did grow some flowers. Mother's red chair stood bright by the fence. hiding the superfluous fragrance in our pockets. distributed in the medicine parcels of various colors. he seems to smell the fragrance of flowers. and smile at me, understandingly. "four-color cards": a card game popular with the Taiwanese folks, usually used for gambling. all at once the street becomes broad and spacious again. because of the washerwoman crossing the bridge. You think of many a street corner. turning around it, you find him gone. the street lamp sighing under the moon. with your back to a set of half-dark wardrobes. used in winter, forgotten in summer. waiting to meet with him again around the street corner. which we have never heard. The wall is a mute recorder. in memory of those absent hats, keys and coats. 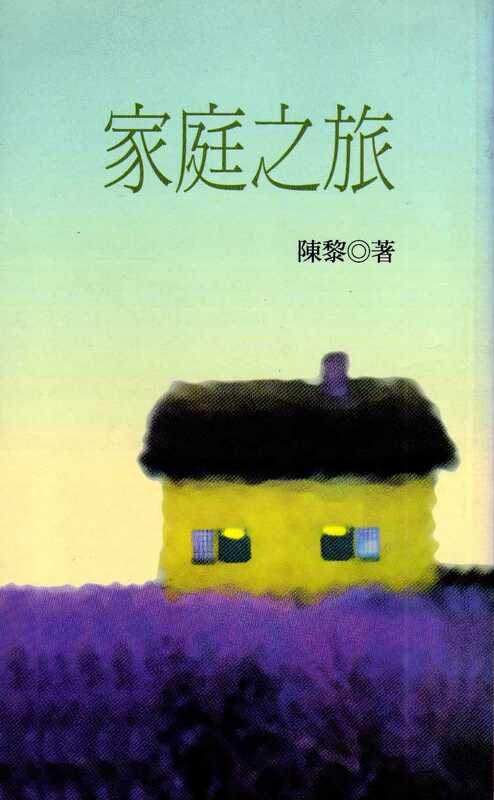 to give shelter to crooked love, rumors and scandals. Hanging on it is the clock. Hanging on it is the mirror. the lipstick marks of sunken dreams. leading a giant existence sustained by our frailty. stopping before the traffic light. She didn't find me looking at her before the other traffic light. a basket to carry vegetables home after work. and then come back to where I live. I know that she will dance and jog in the neighborhood primary school the next morning. we waited to cross the street with the crossroads between us. where different tears and music meet. and then disappeared from each other's rearview mirror. become legitimately and healthily lustful again. burdened with our previous luxury. with the water pressure of a whole reservoir. making crime argue uneasily with punishment. repent to our hearts' content. the witness of a prodigal son. screamed out "Danger," "Keep Off," and "Detour." flows a river of shadows. A houseful of tea fragrance allures us into sleep. may be our parents, who have fallen into the cups. warmly dissolving the descending darkness. vanishing into the river of shadows. he said to me, "Son, all magic arts are real..."
those running cars, those motionless houses. and a world map when unfolded. until all the people were seated on it. you want to possess but fail to." and connected himself to the flowers with vein-like tubes. He asked us to stab his heart with a knife. "My heart is filled with love. will spit out of those roses." yet found it as sweet as jam. saying we were all in it. the identity cards given to us by eternity. He liked all changing things. so he chose to perform in the moonlight. shocking murders, massacres, and religious revolutions far away. "As long as you believe, a handkerchief can become a flying rug!" to perceive the mystery in them. be burned into new fire? no one believed the handkerchief beneath our feet would fly us to a far-off place. a secret river flowing in his eyes. These poems are written according to some of the music I have heard recently, especially that of Messiaen (1908-1992), Nono (1924-1990), Webern (1883-1945), and Takemitsu (1930-1995). Takemitsu said, "The joy of music, ultimately, seems connected to sadness. The sadness is that of existence. The more you are filled with the pure happiness of music-making, the deeper the sadness is." writing our faunas in the destined space. receiving all the sounds of existence. Your clock is twelve radios telling different stories. Your calendar is musical scores arranged at random. the noise of a truck passing by a music school. the kisses of trees with wind or the dialogue between hammers. and make us hear the open music. John Cage (1912-1992), the most controversial and influential 20th-century American composer, philosopher and writer on music. Breaking off the line between noise and music, he attached much importance to silence in music as well as in life, and regarded every sound as music. His most famous work was 4'33", silence throughout the whole piece. He was also an expert on mushrooms. nine obstinate stones, sat side by side in front of the police substation. Iron chains locked their limbs, but not their souls. his mother, who came to talk him into capitulation under the Japanese’s threat). dignified apathy, dignified freedom...They were inborn stones. This photo was found in Perspectives on Eastern Taiwan, published by Mori Toshiyuki in 1933. Taiwan was ruled by Japan between 1895 and 1945. On September 19, 1932, at Li-Long in the prefecture of Tai-Tung, some Bunun people (aborigines of Taiwan) killed two policemen and one police assistant in Kwai-Gu near the Da-Guan-San police station. The Japanese police went all out to arrest the killers: first they tracked down the suspect Taromu, an influential man of the Kanto tribe; then on December 19 they went into the mountains and caught the principal offender Ramata Siensien with his four sons as well as three younger brothers of Taromu's. 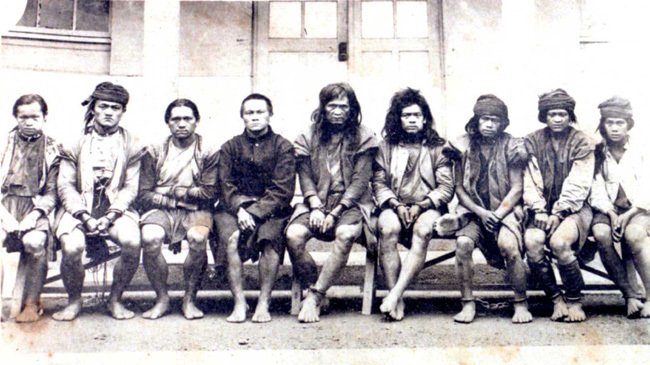 On the photograph, these nine men sat side by side, barefooted. lying loose on a blue uniform. and painstakingly sewing the island and the ocean together. dream and reality, suffering and joy. Time sets its dog biting us. not sure whether to drop it in the nearest mailbox or not. Maybe it is hanging at the door of the railroad station. "A deserted arm to be identified at the information desk." brassieres of the beloved, diplomas. We pick up the toys scattered about on the ground. They are heard to say, "It hurts." The moon is pasted on the sky like a stamp obscured by the postmark. push the pushcart by and ask if he'll buy some medicine. facing a dog barking at the moon with wide-open eyes. They are waiting to pass by us once more. Maybe that's what they call family reunion.